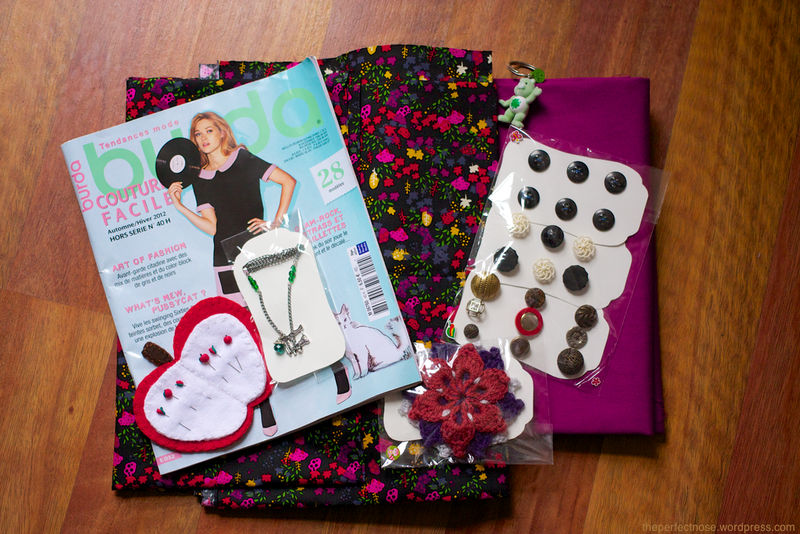 Modechocolat sent me these amazing goodies-people, she made the necklace, the crochet brooch and the apple. The apple.. Sigh. When I opened this package (which was very cutely wrapped but got shredded in my excitement to get at the goodies) I pounced on the apple. It is gorgeous! Also, apple headed pins poked into a felt apple-that is just meta enough to make your head spin. How did she know I needed someplace to store my needles? It’s a little book. And look at the little carrot pin hidden at the back-it’s so awesome (Carl cracked up when he saw the carrot: That is awesome, blog it now blogitnow! No wait, tell her how awesome it is, thank her, then blog it). The pin heads are handmade too, with fimo clay! I was so happy (and still am-every time I look at that apple I feel happy)-I would’ve been over the moon if that had been all but there was more! This Burda and an awesome contrasting pair of fabrics, a cotton lawn and a denim-weight wool twill! Magenta pants are so on! Here’s the link to what I sent (oh and when Google translate says maliciously it means mischievously XP). Also, Bohdana of Poppet Hill sewed up a mod boat-neck dress from the Knipmode pattern from our swap (I’m a big fan of fast swap-sewing turn-over like that), love the dress, love that the pattern’s out there getting used. A couple of other people contacted me about stuff they wanted to swap for and then never responded to my emails. Which is annoying, but good practice for dealing with flaky people in real life. The stash is here if there’s anything you’d like to swap for. If not, it’s all going to end up on evilbay (when I get around to listing it harharhar.. *sigh*). Previously on Patterns and Postcards.